St. Andrew’s Hospital cornerstone “well and truly laid” by the Hon. 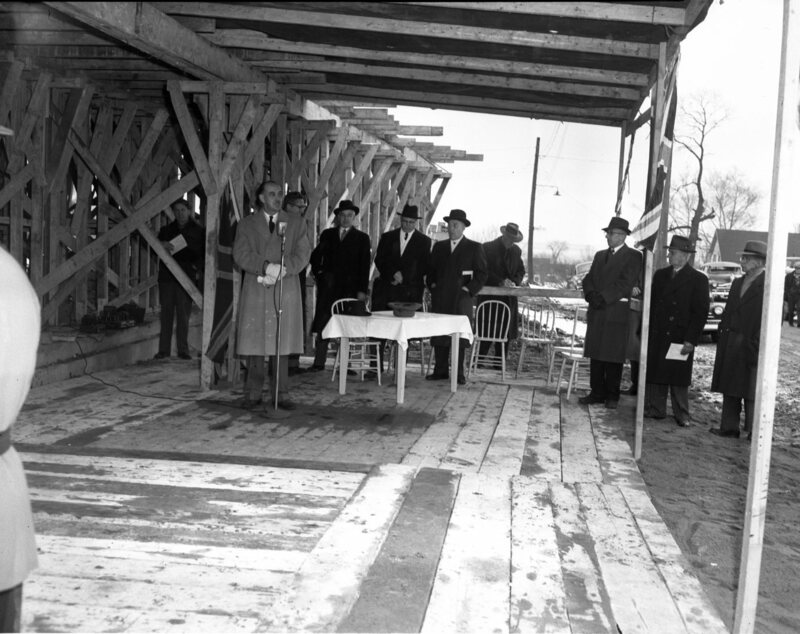 MacKinnon Phillips, Minister of Health for Ontario. Others in the picture are L to R; Stan Jordan, bricklayer foreman Bert Oxford and Rex Timms all members of the R. Timms Construction and Electrical Ltd., the contracting firm. Comparatively good weather for mid December blessed the event, the same weather that has helped in the progress on the building. Three thousand dollar boost to the new hospital from the Midland Lion’s Club. The club is financing a children’s nursery and plan to endow it permanently. 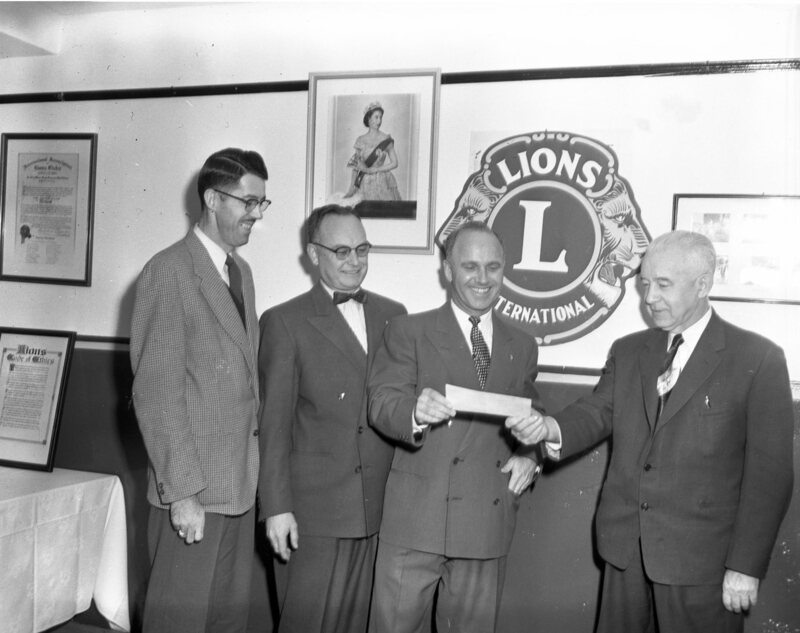 Lion Adam Miller, Lion’s president Bill Orr, Lion Bill Hack presenting the cheque to V.G. Edwards chair of the hospital’s special finance committee. 70 railcar loads of Christmas trees shipped from Penetang and 10 from Midland averaging 1300 trees per car, a total of 103,000 trees have been loaded for mostly USA destinations. 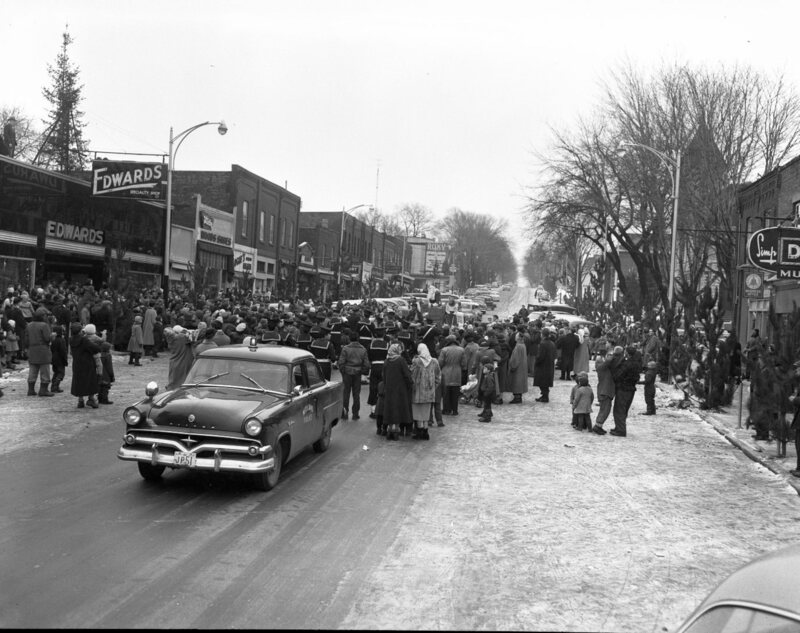 Santa Claus – Old and young throng King Street on Saturday morning to greet Santa Claus. 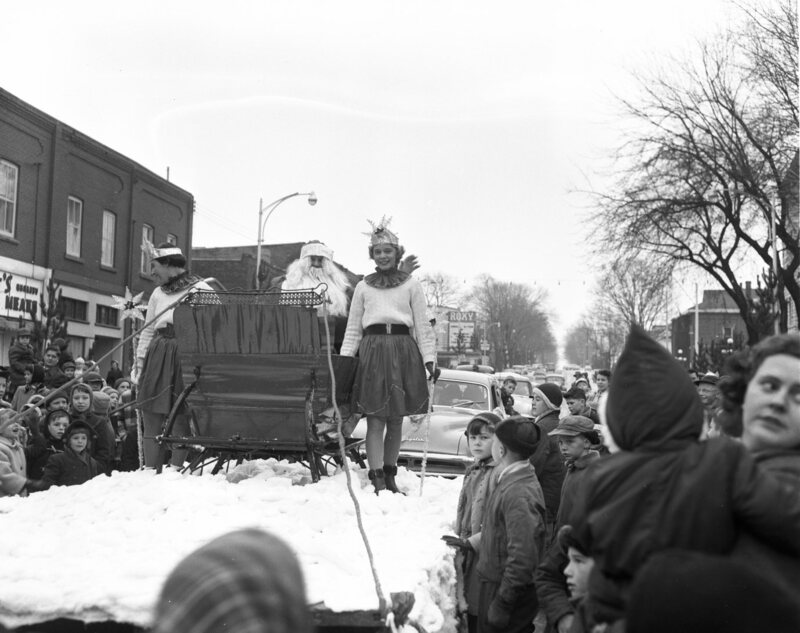 The jolly old gent is shown waving at the crowds as he prepares to leave his sleigh and enter Edwards Specialty Shop. Second photo, flanked by two helpers, Carol Parizeau on the left and Marlene Fraser, Santa beams merrily. Santa will listen to the pleas of 2500 children on his throne in Edwards Toyland. 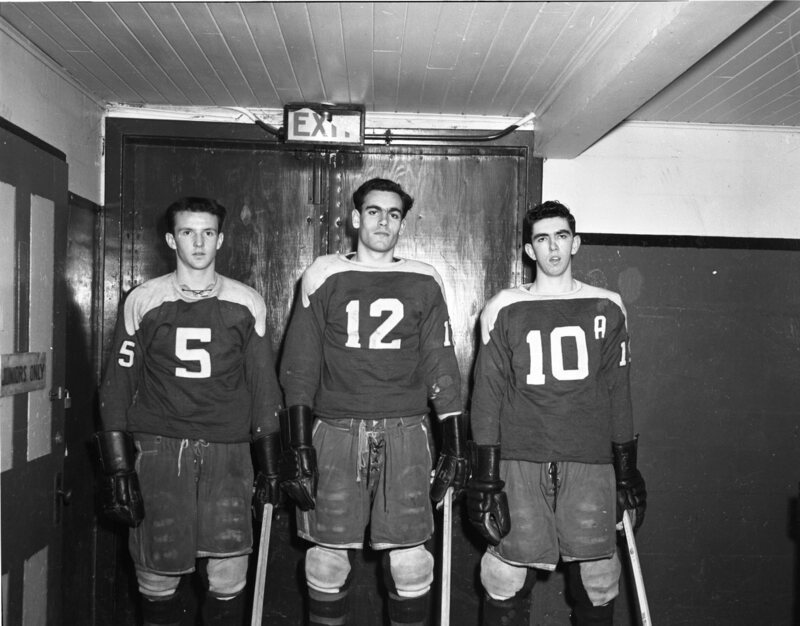 Midland’s Junior Redwings members, Bruce Calvert, Jim Lemieux and Joe Faragher. All played juvenile hockey last season although Calvert was called up to help the Wings in their final drive for the championship. First woman ever to sit on Tay Council led the polls in last Mondays election. Mrs. Minnie Mayhew joins Cecil Parker, Loran Williams and by acclamation Reeve Fred Kinnear and deputy reeve Ralph Dalton. 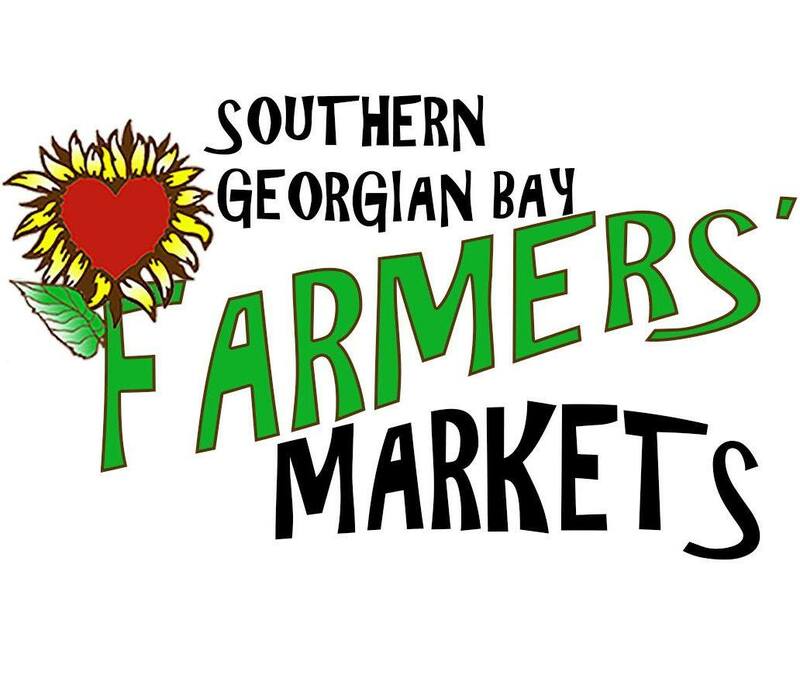 Eady, Severn Falls, Wyebridge, Hillsdale, Melduf, Hobart, Port McNicoll, Waubaushene, Allenwood, Elmvale, Crossland, Vasey, Lafontaine, Rosemount, Perkinsfield, Victoria Harbour, North River, Lovering, Waverly, Fairview, Elmvale, Coldwater, Phelpston, Creighton, Sunnyside, Mount St. Louis and Tiny Township. The larger communities had weekly news and the smaller ones were published periodically. Each community had its own column and often its own local correspondent that collected and submitted the news. Six year old Linda Duval struck and seriously injured by a vehicle while tobogganing at her home on Robert St.
Christmas mail rush is on. 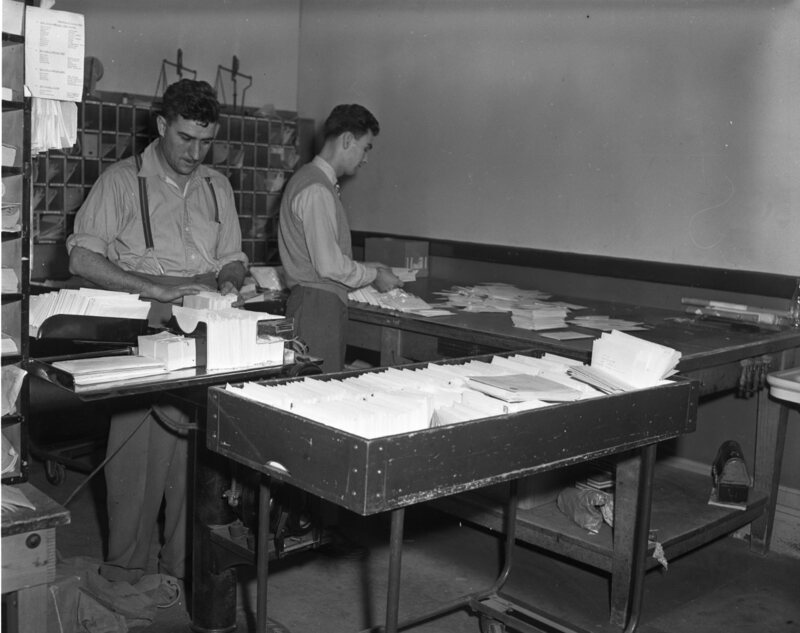 Bob Goatcher and Armand Marion wade through stacks of cards and letters.